Photographic Restoration by Grayscale Imagery. 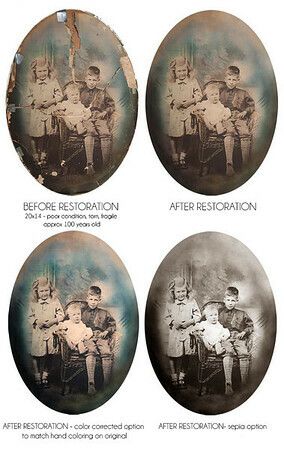 Preserve, restore, and bring antique photos back to life. 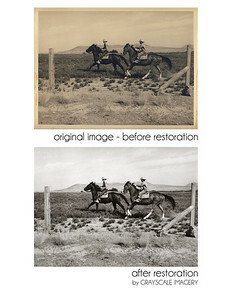 8x12 photo restoration - corrected look of faded and aging paper. also removed minor spots. 20x14 photo restoration - very poor original condition, torn, warped, missing pieces, duct taped together. I corrected torn spots, recreated missing pieces, removed major marks/cracks/lines, etc, plus provided options for final image display (original look with corrections, hand painted, or black & white). Also found client an antique frame to reframe the new restored photograph. Getting married? Need a Photographer? Click here to ask Rachel if your date is still available.